We are looking for a plasma physicist to join our staff in support our new ARPA-E contract on the Princeton Field Reversed Configuration (PFRC) experiment. Help run experiments on the PFRC-2 (located at the Princeton Plasma Physics Laboratory) and analyze data. Analytical and numerical work, including MHD simulations and PiC simulations. Work in other areas at PSS including control, estimation, machine learning and orbit dynamics. Programming in MATLAB, Python and C/C++. Write proposals and come up with new topics for proposals including SBIR and STTR proposals. Here he is at his booth. Super Technologies represents several high technology aerospace companies. Today ARPA-E announced announced that PFS has received a competitive $1.25 million award from the U.S. Department of Energy’s Advanced Research Projects Agency-Energy (ARPA-E), as part of the Energy cohort of OPEN 2018. Princeton Fusion Systems seeks to develop technologies to enable future commercial fusion power. Our team’s concept is a small, clean, and portable design based on a field-reversed-configuration plasma. The concept uses an innovative method called odd-parity rotating magnetic field (RMF) to drive electrical current and heat the plasma to fusion temperatures. Under this award, the team will pursue improved electron and ion temperatures through RMF, as well as identify the modeling needed to elucidate the key heating and loss mechanisms for the fusion reactor concept. The team’s ultimate power plant design seeks a very small footprint for a compact, potentially transportable, distributed energy resource that is fully dispatchable and emissions-free. PFS received this competitive award from ARPA-E’s OPEN 2018 program, in which teams develop innovative technologies to transform the nation’s energy system. OPEN solicitations are an open call to scientists and engineers for technologies across the entire scope of ARPA-E’s energy mission. This work complements three NASA grants for the development of this technology for nuclear fusion rockets for human and robotic space exploration. This includes the NASA Phase II NIAC Grant, “Fusion-Enabled Pluto Orbiter and Lander,” and a NASA Phase II STTR, “Superconducting Coils for Small Nuclear Fusion Rocket Engines“, and a Phase I STTR, “High Efficiency RF Heating for Small Nuclear Fusion Rocket Engines.”. These contracts build on over 20 years of collaborative work between Princeton Fusion Systems and the Princeton University Princeton Plasma Physics Laboratory. This unique nuclear fusion concept was invented by Dr. Samuel Cohen of the Princeton Plasma Physics Laboratory. Princeton Satellite Systems was founded by Mr. Michael Paluszek in 1992 to develop advanced space and terrestrial technology. It has developed a wide range of space and terrestrial technology including advanced spacecraft control and navigation systems, formation flying systems and terrestrial energy systems including solar, wind and nuclear fusion. 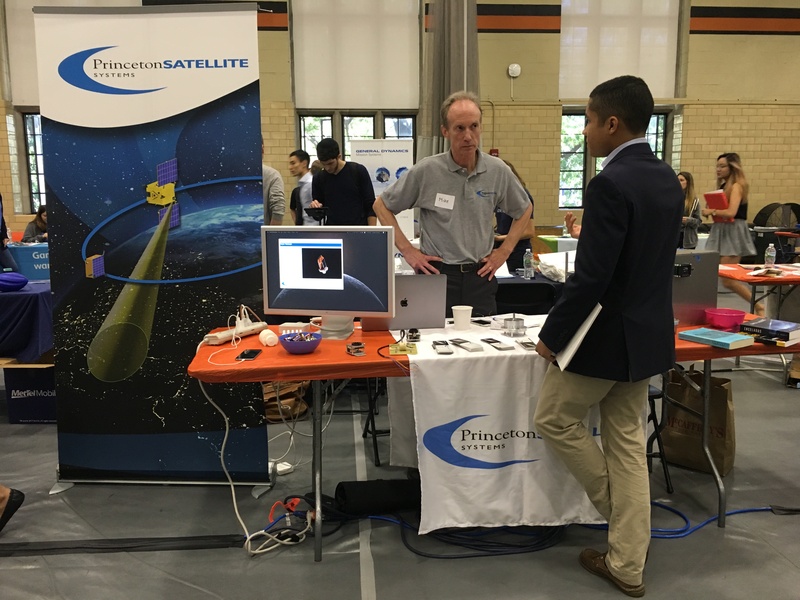 Princeton Satellite Systems had a table at the Princeton University Science and Technology Job Fair on Friday, October 12. Many companies attended including the IBM Thomas J. Watson Laboratory, Facebook and Siemens. We had on display hardware and software that involved the work of interns at PSS. The exhibits were of great interest to the many students who came by our table. From left to right is an iPhone App for talking with a reconnaissance satellite, a lunar landing simulation on the LCD monitor, parts of an optical navigation system, a Class E RF amplifier, a reaction wheel and a frame for a small satellite. Many students who came by were very knowledgeable about our work. Here I am talking with one of the students. It was great event! We look forward to talking with the students when we interview for summer and full time jobs in January. The past 10 weeks at Princeton Satellite Systems have been a life changing experience. During my summer off from the University of Pennsylvania, I have worked as an intern for the company. This gave me the opportunity to learn from trailblazers in the industry and to be immersed in a community passionate and dedicated to the work. 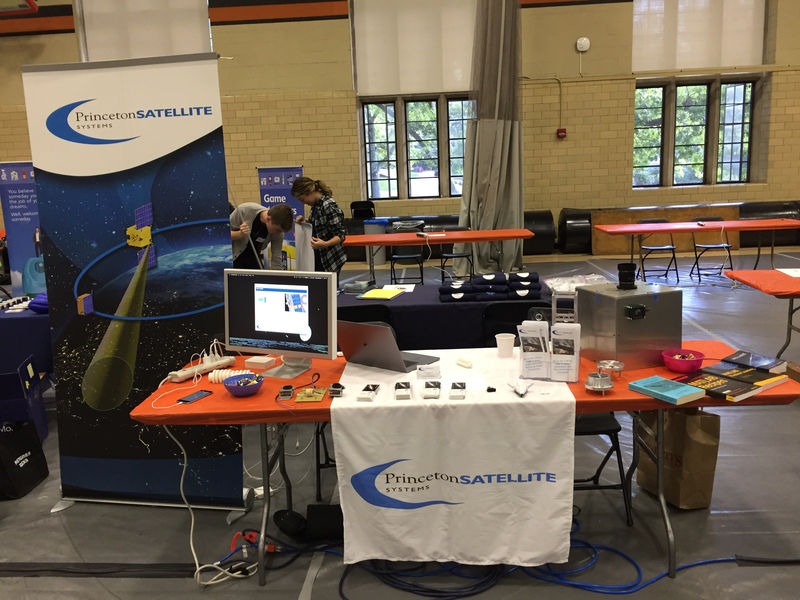 I first heard of Princeton Satellite Systems at the Dawn of Private Space Science Symposium in 2017. After that, Mike graciously agreed to come speak for the Penn Aerospace Club in the fall and the Ivy Space Coalition Conference the next spring. Everyone in attendance was fascinated by the presentation and I felt so lucky that I would have the chance to learn so much more soon. Connections like these are what drive the aerospace community and as I expand my communication I hope to stay closely in touch with the people I came to know at PSS. Through my work, I’ve been doing a lot of Matlab modeling: sizing the components for the Direct Fusion Drive engine, testing a rotating detonation engine, and MHD plasma simulation. The idea of these technologies enhancing propulsive power and efficiency is fascinating and has great potential for the future of space travel. My summer at Princeton Satellite Systems has helped me to enhance my technical understanding and skills: I’ve definitely gained a ton of experience in Matlab, and all of my studying of plasma modeling should give me a head start in my fluids class next semester! I’ve also gained a much better understanding of how the professional world works. I got to help write and edit proposals, sit in on phone calls, and even attend the NIAC meeting at Princeton Plasma Physics Lab. I think that there’s a great benefit in working at a smaller company. You are given plenty of real responsibility and see the changes happening in real time. I will definitely take the lessons I’ve learned this summer and apply them to my education as well as my future career as a mechanical engineer. I am so grateful for this opportunity. Everyone has been so kind and helpful and patient. The time has flown by, and it definitely made staying in my little Princeton dorm with no air conditioning well worth it! I’ll miss coming in to work every day but I can’t wait to see all the big things that PSS accomplishes. The audience learns, watching the movie “Solo,” that the Millennium Falcon has a nuclear fusion power plant! The Millennium Falcon is a modified YT-1330 Corellian light freighter manufactured by the Corellian Engineering Corporation. PSS Dress Code: What is “business casual”, anyway? Shorts and sandals are OK in the summer – we prefer to turn the thermostat up and save money on A/C! Leggings – leggings are not pants! Leggings should be treated as footless tights and always paired with dresses or tunics. Camisoles/spaghetti straps – camisoles are not blouses! Anyone working on hardware should wear closed-toe shoes and tie back long hair, as in any lab space. A side comment: my husband is a tech executive in New York, and he wears what I call the “tech uniform” to work every day: dark jeans from Banana Republic, button-down shirt, brown dress shoes, and a navy blazer. Now, guys in tech get away with this, but probably not lawyers! As PSS is solidly in the tech regime, we definitely take a more casual approach to “business casual”!